Morning Activity: Meet in the hotel lobby at 10 AM to travel as a class to La place du Général-Catroux analysis of major statues and public installations in Paris commemorating three generations of the Dumas Family. Today we are going to learn about three generations of the Dumas Family and how they have been memorialized in Paris, France. In your small groups, evaluate the three sculptures by discussing the following questions. Identifying basic information: Can you determine who the artist is? Who commissioned it or why the piece was made? When? Where? 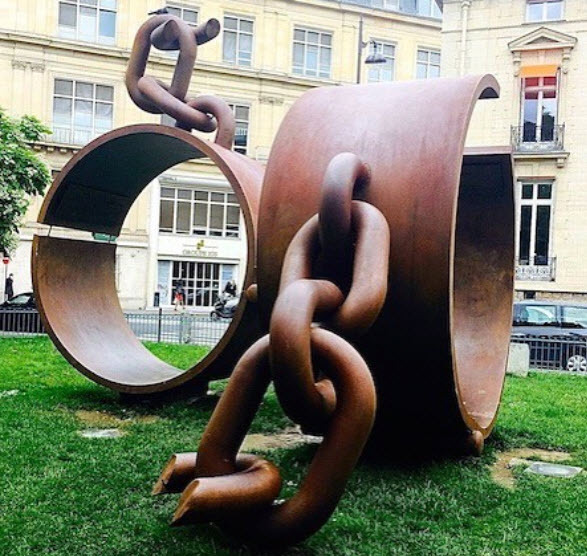 Medium: What is the sculpture made out of? What material is used (stone, marble, clay, wood)? What technique was used to recast the materials into this form? Was something carved away to make this or was it ‘built up’ from something like clay? Scale: What is going on with size here? Are different subjects or objects the same or different size? What is being highlighted? Composition. How is the statue organized? Is there a focal point? Is this composition unified or fragmented? Is there asymmetry to this piece or a hierarchy? Is there a clear line? Form and the human body: Are the bodies natural and realistic? Idealized? How are they interacting with each other? Can you identify who is represented? Content and symbolism: How does the subject convey its meaning? What symbolic elements are at play? Emotion: How do you feel looking at it? Interacting with it? Site and context: Why is this artpiece here? How does it relate to other architectural or design elements in the area? Additional questions to discuss: What is the role of color? How is light being used or not used? *Excerpts of classic Dumas Literature: Explore work by Alexandre Dumas like The Count of Monte Cristo and the Three Musketeers and the work of his son Alexandre Dumas, fils who was a playwright including La traviata and La Dame aux Camélias. I suggest keyword searching for phrases you’re interested in or practicing distance reading. What is unique about the Haitian Constitution? What rights are given that we do not have in the American Constitution? The article about Frederick Douglass casts him as a refugee. What are some of the similarities and differences between fugitive slaves in Antebellum America and contemporary Syrian and Latin American refugees? What genre is Three Years in Europe? A slave narrative? Abolition treatise? Travel writing? Memoir? Brown’s first stop is Liverpool, England. Why do you think he went there first? On pages 7-9, Brown articulates his belief of racial difference in America vs. Europe. What does he anticipate? What does William Wells Brown like best about Europe? What does he struggle with? What cities or countries are significant to him? Why? What site is Brown visiting on p. 34-37? Do you agree with his description? Between pages 40-73, Brown goes to many of the sites we have gone to in Paris / or are soon going. How does your experience change thinking of these places through his eyes? Explore the Douglass map. What patterns do you notice? Tonight, we would like you to practice analyzing photography and visual sources. Please write three to five paragraphs analyzing one or two images from the above collection. Be sure to provide the image(s) you are using in your post, the link back to the original Library of Congress link, and give the full citation for the images you use. Beyond the usual history questions (when was this created, by who, why, how was it distributed etc) think about its visual elements. Things to possibly consider include framing, focus (foreground/ background), setting, perspective, symmetry, positive and negative space, lines, lighting, posing, motion, tone, subject, theme, angle, or composition. If you were in charge of this exhibition, how would you categorize or group the photographs? What themes would you highlight? What do you think contemporaries in Paris thought of these photographs?